If we have some cake left-over we always bag it and save it in the freezer instead of throwing it out. After some time we have saved enough cake so that we can make some Danish Rum Balls or these Danish Tree Logs. 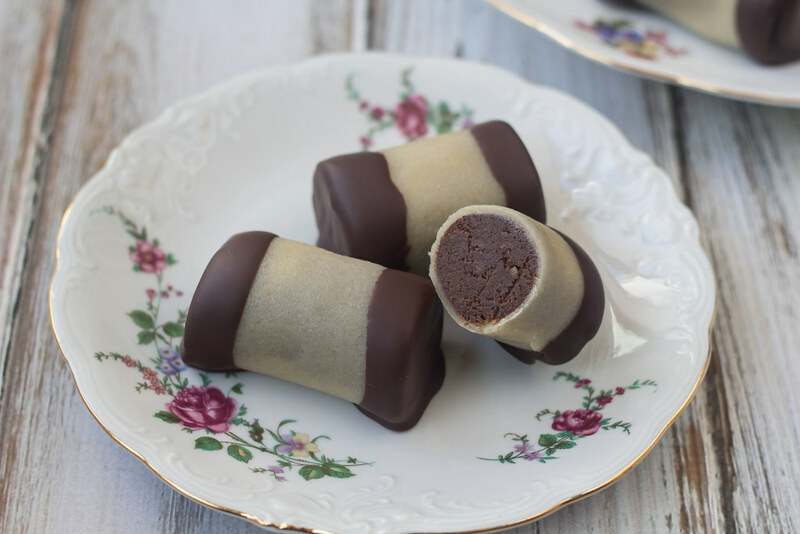 In Denmark these marzipan-covered-rum-cakes are called Træstammer which translated means Tree Logs. Danish Tree Logs are a very traditional dessert and have been made and sold by the danish bakers for many, many year. We both remember having had these as kids and that we loved them! 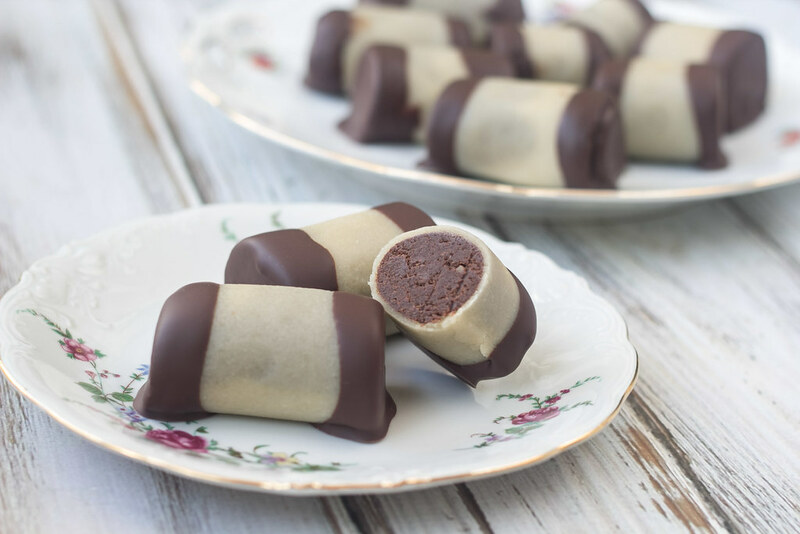 A Danish Tree Log is made from left-over cake which is blended together with some marzipan (almond paste), dark chocolate, raspberry jam and a little rum essence. 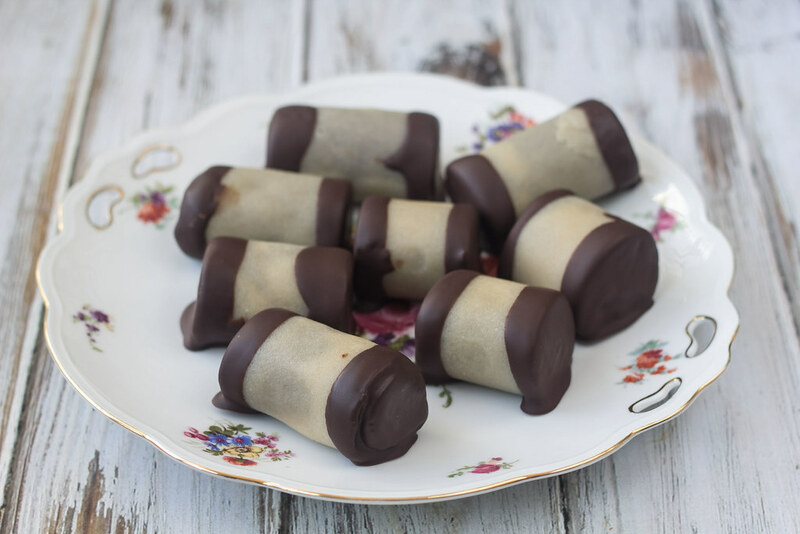 Then they are covered with marzipan and dipped in chocolate. You can use different types of cake e.g. Danish pastry and chocolate cake. However, we personally prefer chocolate cake which goes great together with the dark chocolate which is added to the ‘batter’. 1. 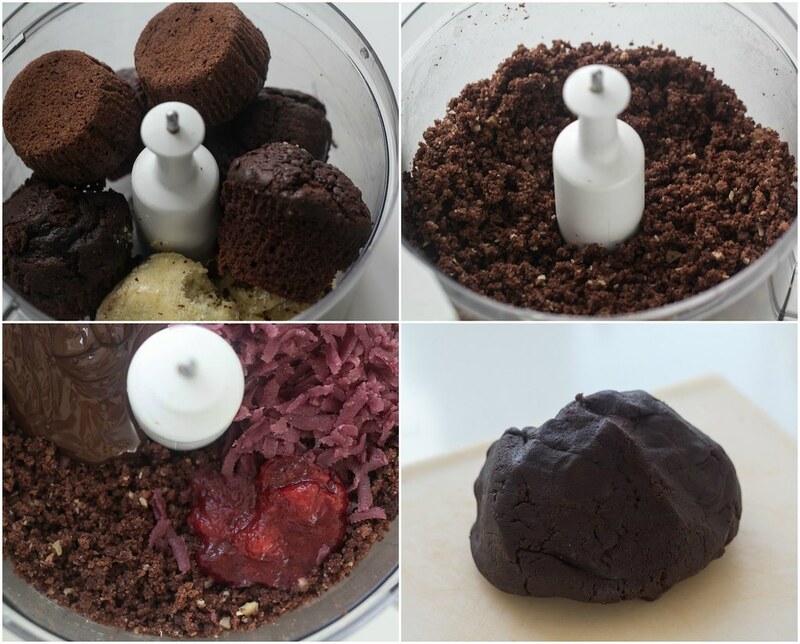 Cut the cake in smaller pieces and pour it in a food processor. 2. Grate the marzipan and melt the chocolate; pour it into the food processor. Also add the raspberry jam and rum essence. 3. Run the food processor until all the ingredients are completely mixed into a sticky dough. 4. 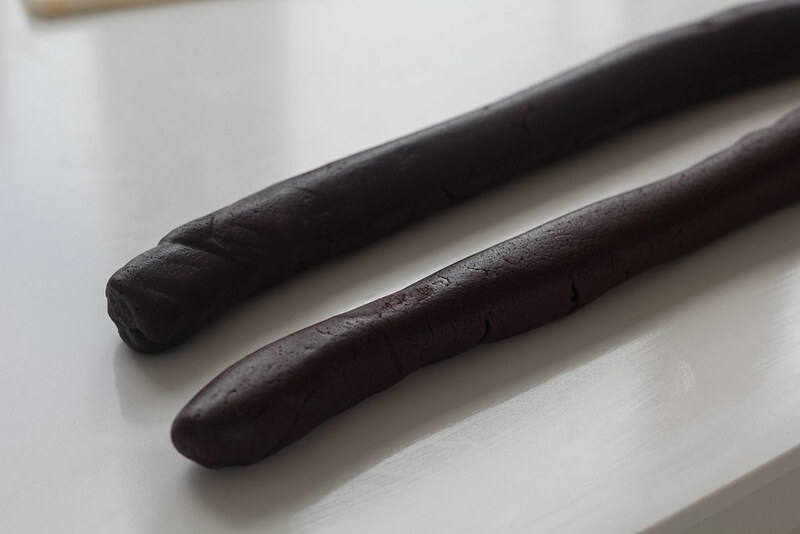 Roll the chocolate dough into two logs with a length of about 40 cm (15 inch) each. Let the logs cool in the fridge while preparing the marzipan covering. 5. Make the marzipan covering: Start by bringing the marzipan to a room temperature. 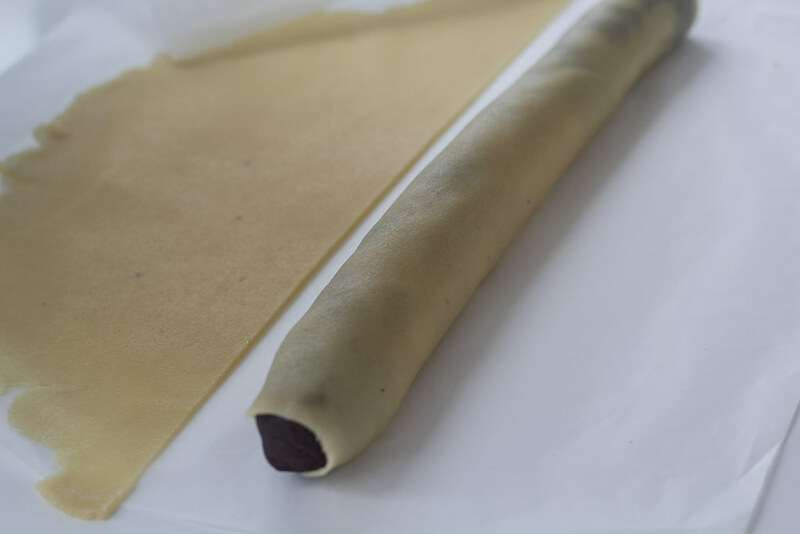 Using a rolling pin; roll the marzipan into a thin squared piece. If you sprinkle the kitchen table with a little icing sugar, then the marzipan will be easier to remove afterwards. 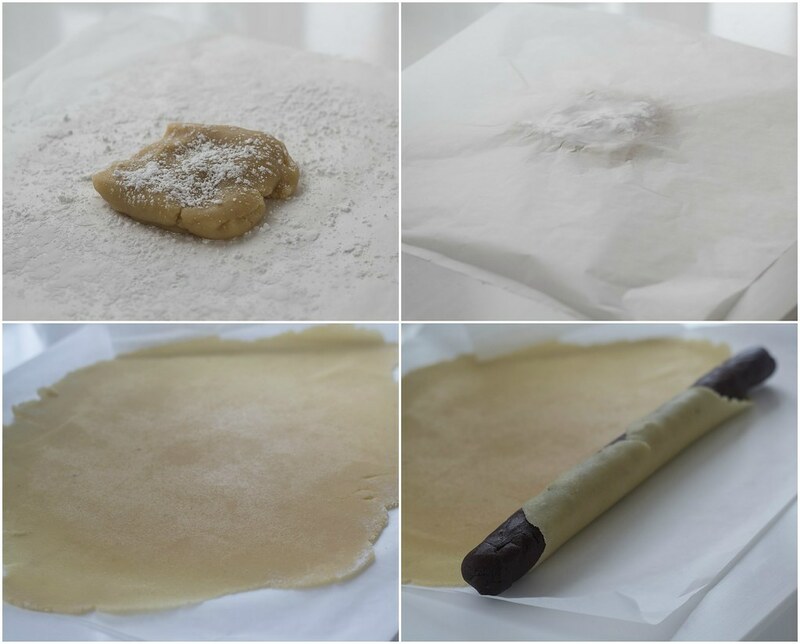 You can also trying using a sheet of parchment paper instead of icing sugar. 6. 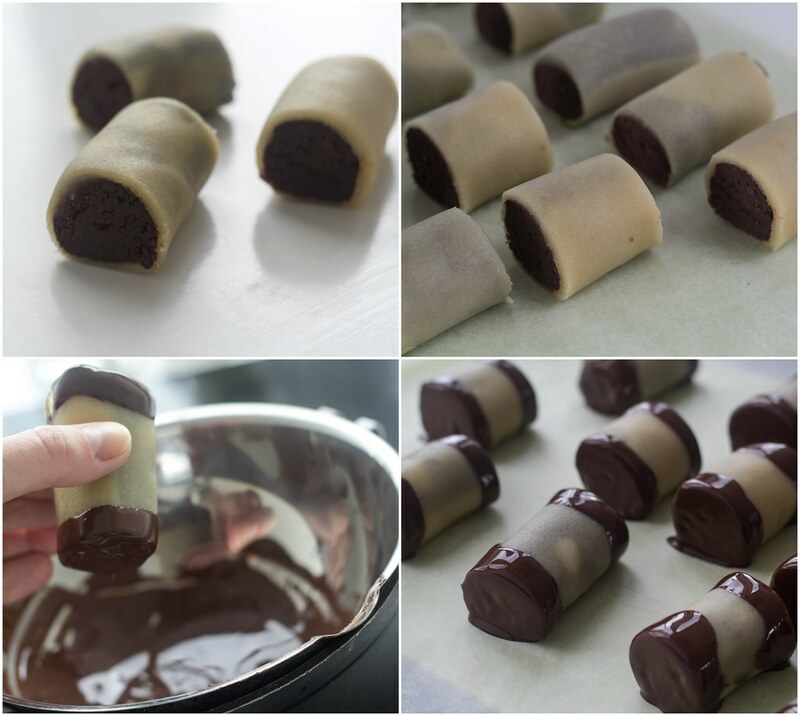 Divide the rolled marzipan into two pieces. 7. 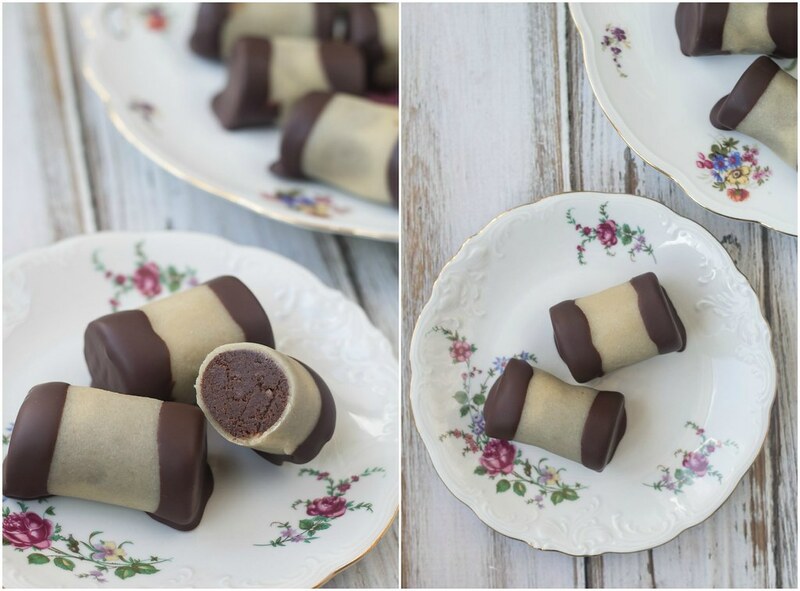 Place the chocolate logs on the marzipan and roll them so that the entire logs are covered with marzipan. 8. Cut the logs into smaller pieces with a length of about 8-10 cm (3-4 inch). 9. Melt the chocolate in a water bath or using the microwave on low heat. 10. Cover a chopping board or similar with parchment paper. 11. Dip each end of the logs in the chocolate and place them on the parchment paper. 12. Let the logs cool off until the chocolate is completely hardened. Beautiful photography. beautiful everything! Love the site, I will be a frequent visitor. I just found this site! My grandfather is from Denmark and isn’t well at the moment and I’m looking for things to make him that will perhaps bring him some extra joy – we plan to have risalamande next weekend for Christmas! For the Tree Logs, is it okay if the leftover cake is frosted (as most of my cake leftovers are) or is it preferable that there be no icing? Would I perhaps reduce the marzipan in the filling to account for the moisture imparted by any frosting? Thanks! Hello, I really want to try making these, but my chocolate cake did not rise at all and is kind of chewy and really close textured, would this recipe still work? Best regards from the UK! Hi Greta. These cakes are not supposed to rise. I hope that you like them. I would try to use the cake you have made. I actually think it might still work. Hej. Jeg fik også altid at vide at ingredienserne, var opfej fra bagerens gulv. Jeg ved dog ikke om det er rigtigt, det lyder lidt mærkeligt syntes jeg. Jeg kan også huske at endestykkerne, med chokoladen, altid var dem som blev spist først. Jeg er glad for at du har fundet opskriften og at du kan lide den. Hvis du er interesseret i en lidt mere sukker-fattig opskrift, kan jeg anbefale min opskrift på træstammer med dadler. Du kan finde opskriften her på min blog.